Click here and here for some more background information. "The first ethics dealt with the relation between individuals; the Mosaic Decalogue is an example. Later accretions dealt with the relation between the individual and society. The Golden Rule tries to integrate the individual and society; democracy to integrate social organization into the individual. "There is as yet no ethic dealing with man's relation to land and to the animals and plants which grow upon it. Land, like Odysseus' slave-girls, is still property. The land-relation is still strictly economic, entailing privileges but not obligations. "The extension of ethics to this third element in human environment is, if I read the evidence correctly, an evolutionary possibility and an ecological necessity. It is the third step in a sequence. The first two have already been taken. Individual thinkers since the days of Ezekiel and Isaiah have asserted that the despoliation of land is not only inexpedient but wrong. Society, however, has not yet affirmed their belief. I regard the present conservation movement as the embryo of such an affirmation. "An ethic may be regarded as a mode of guidance for meeting ecological situations so new or intricate, or involving such deferred reactions, that the path of social expediency is not discernible to the average individual. Animal instincts are modes of guidance for the individual in meeting such situations. Ethics are possible a kind of community instinct-in-the-making. "All ethics so far evolved rest upon a single premise: that the individual is a member of a community of interdependent parts. His instincts prompt him to compete for his place in that community, but his ethics prompt him also to co-operate (perhaps in order that there may be a place to compete for). "No important change in ethics was ever accomplished without an internal change in our intellectual emphasis, loyalties, affections, and convictions. The proof that conservation has not yet touched these foundations of conduct lies in the fact that philosophy and religion have not yet heard of it. In our attempt to make conservation easy, we have made it trivial." 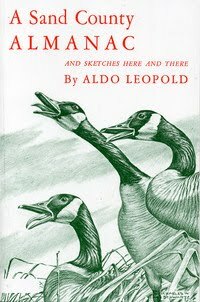 A Sand County Almanac and Sketches Here and There, Aldo Leopold. London: Oxford University Press, 1949.